Looking at the trend of the phone displays getting larger and larger, we can definitely say the boundaries between the phones, phablets and tablets is getting thinner day by day. 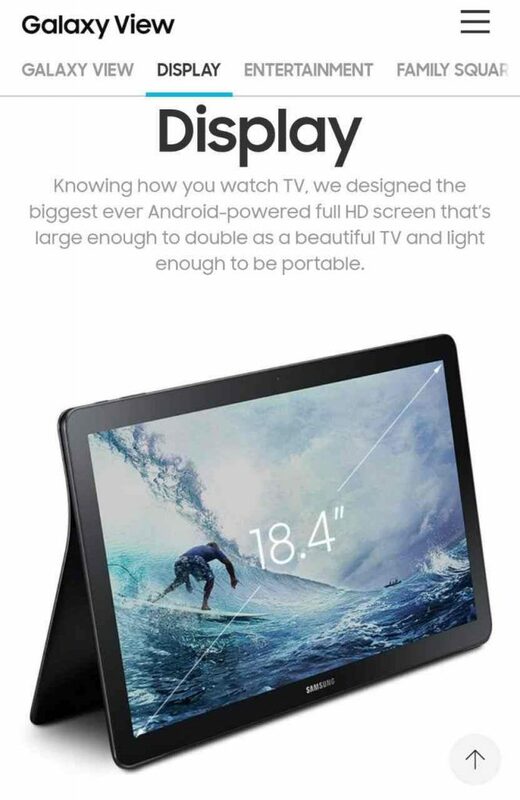 Of course there exist monstrous tablets like the Samsung Galaxy View with a whopping 18.4″ screen, but they should be counted as glorious exceptions. To get the most out of the display, the contents should cover maximum portions of it. Games or videos or even ebooks can only be enjoyed when they actually utilize every nook and corner of the crispy high definition panels. While designing Android, Google incorporated a number of such full screen modes – namely lean back, immersive and sticky immersive. The last two are particularly interesting, as they allow to bring back the status bar and/or navigation bar anytime. 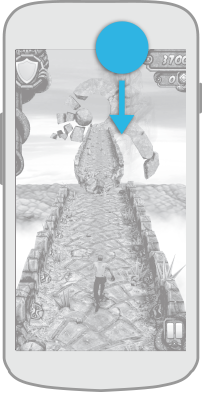 When users need to bring back the system bars, they swipe from any edge where a system bar is hidden. By requiring this more deliberate gesture, the user’s engagement with your app won’t be interrupted by accidental touches and swipes. However, these functionalities can only be programmatically called from an app. 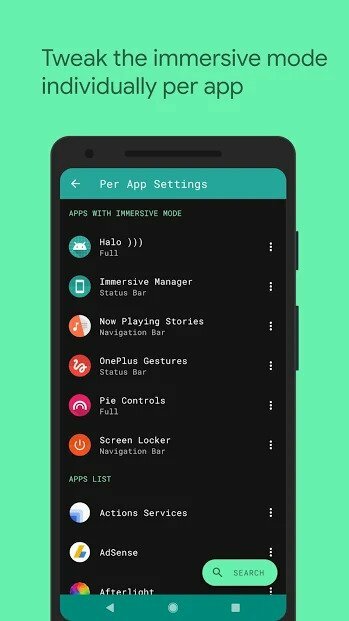 Android does not give users a native solution to have full immersive mode on the system UI. With the release of Galaxy S10 lineup, Samsung embraced the notched display design. Instead of traditional notches, the Korean tech giant came up with ‘Infinity-O’ displays with an innovative punch hole design. The inclusion of a punch hole (two, in case of the Plus variant) started a whole new world of creative wallpaper designing, but that’s out of scope of this article. The design also unlocked a substantial amount of extra space at the top of the phone. Nevertheless, the One UI skin based on Android Pie in Galaxy S10 does not feature a system wide immersive mode. It would be immensely useful for the sake of user experiences, but hey! Samsung is Samsung. Hi everyone, I was wondering if anyone has found a way to get full immersive mode. I know you can hide the navbar but I’d love to hide the status bar as well and make it so that apps go around the camera hole. I don’t want to hide the hole but want to put the whole screen up so that I don’t see in every app the time and all the status bar icons. Thanks a lot! Interestingly, there is a long known set of ADB commands to get system-wide immersive mode working. Thing is, the method is reportedly not working properly on Galaxy S10 as it results in a black bar on top. Presumably the punch hole detection in the system UI is contradicting with the modification. 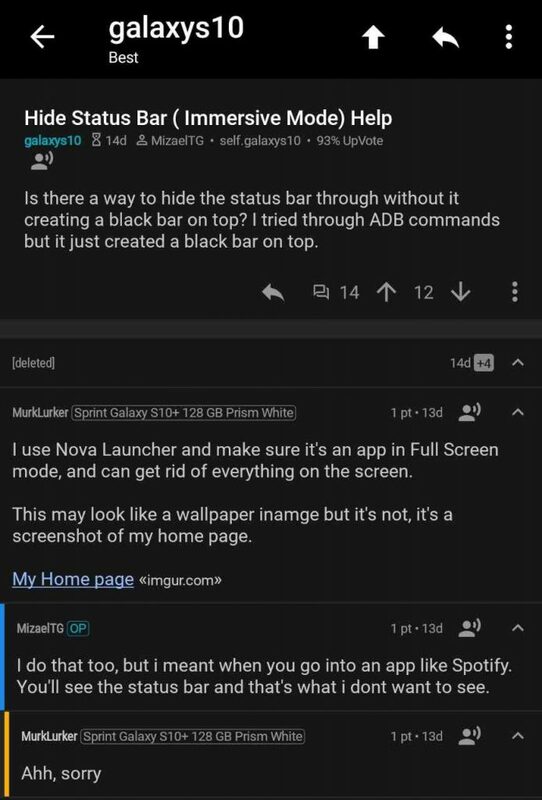 Third party apps (like Immersive Mode Manager) to force the immersive mode are actually using the same ADB commands internally, thus they are bugged with the same glitch. Comment from discussion MizaelTG’s comment from discussion "Hide Status Bar ( Immersive Mode) Help". It is possible to emulate the feature partially with third party launchers like Nova, but the experience will not be truly system-wide. 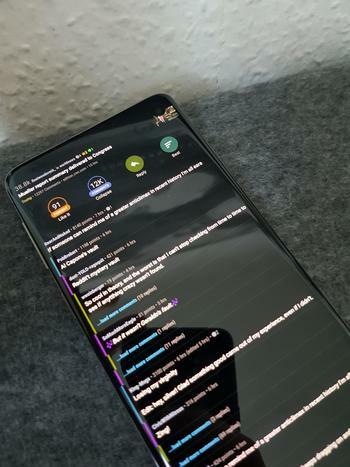 The community members didn’t lose hope, and they actually found a nifty trick to achieve proper full screen aka immersive mode on Galaxy S10. … And because the usual adb commands do nothing I remembered that app cloner had a bunch a display settings which you can mess with. And viola! It has an option to flag apps as immersive mode apps and it actually works! It seems to use a different hook/way to force apps into immersive mode and the result is just beautiful!!! Now you can really enjoy the Display of the S10. A user has shared a video as well, so that readers/viewers can feel the difference. FYI, the mentioned app (App Cloner) was banned from Google Play, thus you have to sideload it manually. You also need to purchase the premium package to unlock the Immersive mode setting. Do you personally prefer the full screen immersive mode in your phone? Comment below.